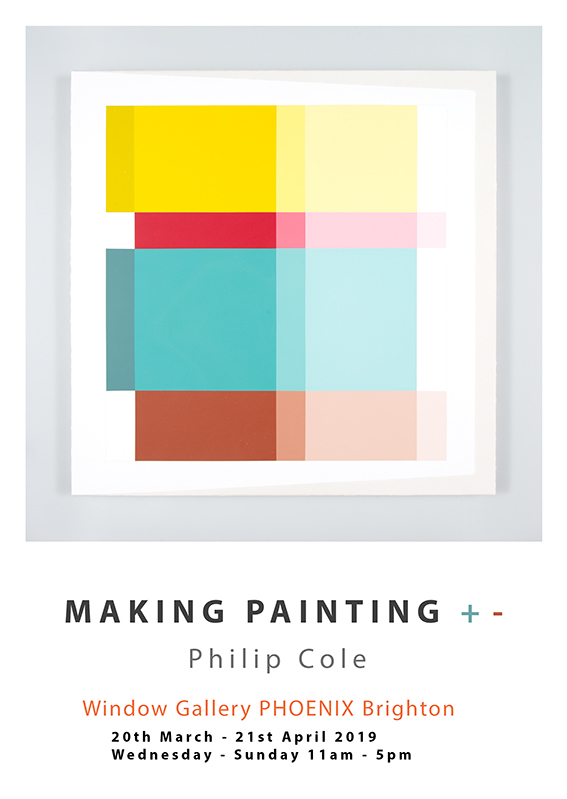 Making Painting + - at Phoenix Brighton This exhibition will feature some of my new work and experiments. The window gallery is a space where Phoenix artists show finished work, explore new ideas, and present work in progress - come and see what I have been up to. 20th March - 21st April. Open Wednesday’s to Sundays 11 - 5 pm. You are welcome to join me for the pv on Saturday evening 23rd March from 6 - 8pm. Phoenix Open Studios preview is Friday 18th May 6-9pm at Phoenix Brighton 10-14 Waterloo Place Brighton BN2 9NB. The current exhibition in the main gallery features Brett Goodroad. There is also a display of diverse works by artists working at Phoenix and last but not least the studios are open for you to take a peak inside - that's over 100 studios. I'll be opening my studio too so do pop in and see some of my latest work. If you are unable to make the preview, Phoenix Open Studios is open from Saturday 19th May – Sunday 20th May. From 11am - 5pm. It features Limited edition works created by the artists who have exhibited in the gallery over the last 3 year period. I will have a limited edition called 'Anthropocene' on display and for sale. Edtions 17 also features excellent and thought provoking work from other artists including Becky Beasley, Tom Hammick, Poppy Jones, Joseph Long , Nick Snelling and more. I was the featured artist of the month for July at Phoenix Brighton. Check out the entry and read about other artists who have studios at Phoenix Brighton here. Phoenix is opening its doors again during the Brighton Festival. There's a preview event on Friday 12th May, 6-9pm, to which you are invited. I'll be there all weekend, Saturday & Sunday 13/14th May, 11-5pm so it would be great to see you if you're in the neighbourhood. Join me from 6-9pm on March 2nd to celebrate ONCA’s first five years and the unveiling of the new website, logo and gallery frontage. It features Limited edition works created by the artists who have exhibited in the gallery over the last 2 year period. I will have a limited edition called 'Top 20' on display and for sale. There is bound to be some excellent and thought provoking work featured so do come along - you may find a fantastic christmas present to purchase and in doing so you'll be supporting artists from London and the South East. I donated Abstrakt Painting to the online auction that raised funds for Chestnut Tree House’s vital work caring for children with life-shortening illnesses across Sussex, and Brighton Dome & Brighton Festival’s community work such as the Umbrella Club, which provides live art experiences for these children. Proceeds were split, with 80% going to Chestnut Tree House and 20% to Brighton Dome.. This painting is made from coloured polyester – placed, poured and painted onto board; an experiment in application and removal. It was started in 2014 and completed in April 2016. To coincide with the opening of the new Source Skatepark in Hastings, a number of local artists and makers have 'painted' skateboard decks which are now on display at The Source. You will probably recognise my contribution. The 'Deck art' project is designed to raise lots of money for some worthy good causes locally and all decks are for purchase. Response Academy, Charity for kids and Xtrax will benefit from the money raised from this project. Phoenix Brighton had Open Studios the weekend of 6th - 8th May. I will be in my studio and hope you can make it along for a visit ... and there are approximately 119 other studios to see. As part of Brighton Science Festival. ONCA gallery had a number of great events planned for the school half term. I showed recent and previously unseen new work in the gallery and contributed to the Trash or Treasure workshop series. A high-net-worth individual (HNWI) is a person with a high net worth. In the western, and primarily American, private banking business, these individuals typically are defined as having investable finance (financial assets, excluding primary residence) in excess of US$1 million in constant 2006 dollars. Project 78 Gallery, St Leonards, East Sussex. A recent commission for the Townend family, Park Crescent, Brighton UK. Six risers incorporated into York Stone steps spanning two garden levels. In preparation for this commission, I visited, observed and photographed stretches of silver birch trees in England. Silver Birch is a very common broad leaved tree in the UK. It is also a pioneer species which means that it is one of the first tree species to colonise an area that may be bare soil or just scrub or grassland. It is also fairly tolerant to pollution and hence is often planted on exposed or industrial sites. It seemed to us to be an ideal species to represent in the composition. I also kept Gerhard Richter's picture of the Hirsch deer close to mind as I painted each step. Casts, constructed from throwaway plastic packaging. Fabricated in pigmented polyester resins. colecorner mixed records with a fair smattering of audio and visual sequences. The live sound and light escape generated depended on the interaction in real time of the operators - three, who tried to sync their plans with thought transference rehearsed and unrehearsed for a considerable time span, every now and then a story line become discernible amongst the rhythm and sound and other hubbabub. Painted in coloured polyester resin on foam. Casts, constructed from throwaway plastic packaging. Fabricated in plaster and spray paint. This piece was in a show called 'keep off the Grass' We have a lot of Rules and Laws to observe as we go about our daily lives. I think that there are quite a few that should get broken a lot more often and perhaps there must be some others that we are missing and yet are a whole lot more important in the long run. I can’t help remembering the words of the song ‘Alice’s Restaurant’ by Arlo Guthrie about a rather exaggerated and fairly comic response to littering. It's worth a listen. Visitors to the exhibition were encouraged to enter a small structure (confessional) and declare wrong doings (?) anonymously. These were published and celebrated online. All of the items were kept after use, washed, dried and then added to the pile. The Installation commenced on the 1st April 2009 and it was added to daily for a period of 8 weeks. Some of the artefacts dug up from the original Anderson shelter during the reconstruction. Installed in a lawn, these sculptured forms together with varying artificially created craters were based on a flawed conception of what meteorites might look like if they had actually entered this space from another space. A series of 10 pictures featured in the exhibition 'Cracks in the empirical pavement' These works were informed by the false coloured electron micrographs (SEM) of bacterial material and artificially coloured radio wave pictures of distant galaxies. Thin slices of chestnut are set in clear casting resin. Multiples were assembled and displayed with/in a lightbox.